CPT’s Mark Spivak is also co-owner of Dog Star Technologies, LLC. DST conducts canine neuroscience research and develops canine performance and behavioral products. Recently, the DST research team completed its final data acquisition trip at the University of California, Berkeley. 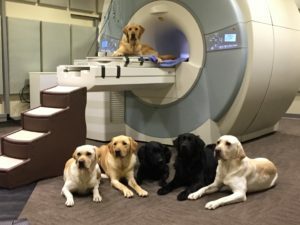 During the past year, DST has visited UC Berkeley’s research scanner to collect fMRI data on 50 prospective Canine Companions for Independence (CCI) service dogs. The data is the major part of a 2-year, $1 million study funded by the Defense Advanced Research Projects Agency (DARPA). The dogs scanned during the Saturday, January 16 session. 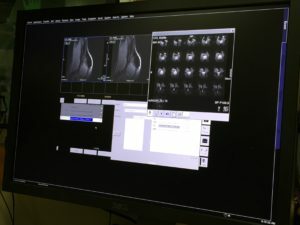 DARPA contracted with DST to employ DST’s proprietary canine fMRI methodology to design a technology that uses biomarkers for identifying high-potential service dog candidates. Service dogs are becoming more important to the military, since there are over 3.8 million wounded warriors suffering from a military employment-connected disability (source: https://www.census.gov/newsroom/facts-for-features/2015/cb15-ff23.html). Of that number, over 1.1 million physically and psychologically disabled veterans have a rating of over 70 percent, which means they are severely disabled. Service dogs are a valuable tool for improving the quality of life of our disabled veterans. However, service dogs are expensive. Private companies will often bill upwards of $20,000 to train a service dog. Nonprofits that have in-house breeding programs will state that their overall cost to prepare a dog from birth to placement is around $50,000 (sources: http://promotions.usa.gov/odep/Thinking_Outside_Box.pdf; http://www.cci.org/site/c.cdKGIRNqEmG/b.4011007/k.22D0/Financials.htm). Yet, on average, the elite nonprofits only graduate 1 of 3 dogs that start their program. Therefore, the actual cost to graduate one dog at a respected nonprofit service dog organization is approximately $150,000. However, once DST’s research creates a predictability model where the nonprofits promptly identify high-potential candidates, then the graduation rate will increase and the resultant cost per dog will precipitously decrease, which means that donor money will go further and more wounded warriors will receive service animals. For instance, if the graduation rate increases to 50%, then the cost per dog decreases from $150,000 to $100,000. If additional data collection over time enables DST’s technology to increase the graduation rate to 67%, then the cost per dog decreases further to $75,000. If the predictability accuracy continues to improve and the graduation rate increases to 75%, then the cost per dog decreases to $66,700. Localizer and functional images of Kalita, a dog scanned during our January visit to UC Berkeley. Since most dogs that fail to graduate are released for behavioral reasons that DST’s methodology can effectively identify, Dog Star’s service can provide wonderful benefits to the military community and US taxpayers. For military veterans with PTSD, amputations, TBI, mobility impairments, or a myriad of other battle-caused injuries, a greater number of service dogs will mean a higher quality of life for more veterans and perhaps for many the confidence and emotional health to get off disability and return to a productive working lifestyle. For the Pentagon, the US Department of Veterans Affairs budget is in excess of $182 billion (source: http://www.va.gov/budget/docs/summary/Fy2017-BudgetInBrief.pdf), of which the 2017 budget lists $66.4 billion in VA medical care costs and $103.9 billion in transfer payments and benefits programs. The VA states that it will provide medical care annually to over 9.2 million veterans. The 2017 Veterans Affairs budgets plans to distribute disability benefits to 4.4 million veterans and 405,000 survivors. Outrage regarding the wait times at VA hospitals has been rampant throughout the media. Yet, veterans with service dogs, who are happier and healthier, are less likely to demand VA mental health, physical therapy, and occupational therapy services, which benefits both the veteran and the VA. Moreover, when veterans return to a productive working lifestyle and demand fewer medical services there is a concomitant benefit to US taxpayers. 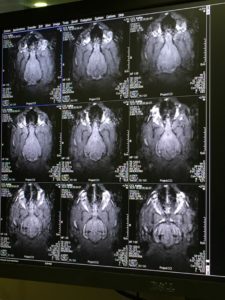 Functional MRI images of Kalita, one of the dogs scanned by Dog Star Technologies during the January 2016 visit to UC Berkeley. Now that Dog Star has completed data collection, the company’s project scientists are undertaking the data analysis, machine learning, and predictive modeling stage. 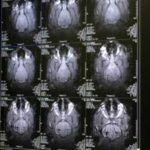 Upon completion, DST will submit a detailed report to DARPA and prepare its fMRI product for international commercialization to private and nonprofit service dog companies that care about providing superior outcomes for their clients. Furthermore, the canine behavioral and neuroscience information obtained via Dog Star’s research will benefit CPT’s service dog program.